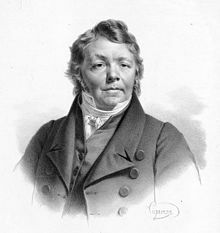 Johann Nepomuk Hummel (born Pressburg November 14 1778; died Weimar October 17 1837) was an Austrian composer and pianist. He was a child prodigy. Mozart thought he was so talented that he taught him free of charge. Hummel became one of the greatest pianists and composers in Europe. He always wrote in a Classical style, he never became an early Romantic like Beethoven. He also wrote a concerto for trumpet, which is fairly famous. This page was last changed on 11 March 2017, at 10:51.